Consumers will be well-satisfied once at least giving the competition a test drive, including the Acura TLX, Buick Lacrosse and Genesis G80. Die-hard Lexus buyers wonâ€™t have to question themselves. As many do, they just trade in the old one for a new model: Always the same ES, never dissatisfied. Some are just creatures of habit! While there are a number of pros to the 2017 ES350, we found a few small frustrations, such as the optional remote touch interface, less than â€œexcitingâ€ handling, and a trunk that is smaller than most. We prefer a performance sedan, yet, the ES350 appeals, probably, to a great many more drivers; especially when in it on a daily basis. On the other hand, there are â€˜prosâ€™ worth noting, and not a surprise to ES350 groupies, such as a quiet and well-equipped cabin, enthusiastic and quiet V6 engine and powertrain, and an expected Lexus-like tops in ride quality. Lexusâ€™ 3.5-liter, V6 engine has been a great engine, dependable and trouble-free, and acceleration is impressive. Legroom in the ES350 is generous and will be appreciated by those with long legs. The advanced electronic safety systems on the ES are standard equipment, and the interior is upscale and well laid out. The luxury version of the Toyota Camry, the ES350’s looks do vary some, and the new styling on the Camry is probably a tad more attractive. We resonated with the updated interior design, soft materials and top stitching. The stitching design has crossed manufacturer lines and we like it, in general. It not only adds a luxo-touch, but it is also sporty. And perhaps a little European? Many donâ€™t appreciate the Lexus mouse-like remote touch interface, but weâ€™re accustomed to it now and find it fairly easy to manipulate, even though easier done when not behind the wheel. Standard features on the ES350 include four wheel ABS, Electronic Brake Distribution and Brake Assist. Safety features also include dual front airbags, dual front knee airbags, front/rear seat-curtain airbags, Supplemental Restraint System, and 3-point safety belts for all passengers. Vehicle Stability Control with traction, Smart Stop Technology, Pre Collision System w/pedestrian detection, high-speed dynamic radar cruise, lane departure alert with steering assist, and intelligent high-beam headlamps are also standard. 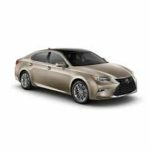 One of the optional packages on our test 2017 Lexus ES350 included the Premium Package (Lexus Memory System for driverâ€™s seat, outside mirrors and steering wheel, wood interior trim, remote keyless entry-linked memory, $730). Other options included the Blind Spot Monitor w/Rear Cross Traffic Alert ($500), 18-inch wheels with High Gloss Finish ($880), Navigation System/Mark Levinson Premium Audio Package (Lexus Enform Destinations, Lexus Enform App Suite ($2,590), Intuitive Parking Assist ($500), Wood/Leather-trimmed steering wheel ($300), carpet trunk mat ($105), Illuminated Door Sill ($379), and Body Side Moldings ($199). A lot of options at high prices. While one could do without many of them, try finding a ES350 equipped with less. The 2017 Lexus ES350 is a desirable sedan that many consumers opt to drive, year after year. And though there are others now in this category just as nice, it would be difficult, if not impossible to convince any long-time ES owners to defect to the other side. Admitted, we hated giving it up after the week. EPA fuel economy: 21/30 mpg., avg. 24 mpg. Fuel Tank Capacity: 17.4 gal. 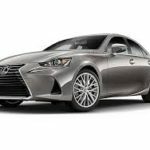 Introduced at this yearâ€™s New York International Auto Show, the 2017 Lexus IS350 sedan takes on a look a little bit more individual. 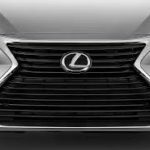 While it must be difficult to design a four-door sedan today that stands apart, Lexus gave it a shot with their controversial front end grille. for them. What we liked were quite a few things, including the smooth powertrain, unparalleled quality, ride and handling. Are its looks â€˜individualâ€? Weâ€™re not just sure. The IS350 feels a little heavy at times, but solid and the new look is a nice departure from the rather boring ES350. Competing with the big boys-Audi, BMW, Mercedes-Lexus has a niche a little different: the â€œexecutive sedanâ€ market. The tried-and-true Lexus owner doesnâ€™t very easily leave the brand and in this fact, Lexus has built an empire. Hard to beat the Lexus commitment to customer satisfaction-from day one-to unmatched reliability. In its own â€˜niche,â€™ the IS350 is still powered by the naturally aspirated V6 engine, while others have gone to turbo fours or sixes. It seems to work for Lexus, and with 306 horse, is pretty satisfying. While a total vehicle price of $49,578 seemed high to us, thatâ€™s the price youâ€™ll pay when playing in this field. Starting just over $41,000, the IS350 we drove had a few big ticket options, including the F Sport Package. Adding the sportiness we like to the IS350, the F Sport Package includes an F Sport front bumper and spindle grille, 18-inch F Sport Split 5-spoke wheels, FR 225/40R18, RR 235/35R18 summer tires on the outside, while inside the car is equipped with the TFT instrument cluster, heated and ventilated front F Sport seats, perforated leather steering wheel with F Sport logo, shift knob, Black headliner, aluminum pedals, back-up monitor, Silver performance trim, F Sport suspension, ($3,155). Additional options on our test IS350 included Blind Spot Monitor with Rear Cross-Traffic Alert and Heated outside rearview mirror ($600); AVS Navigation system/Mark Levinson Audio System, Audio 5.1 surround, 15 speakers, 835 watts, 10.25 inch display, Remote touch interface, Lexus Enform Destinations, App Suite, Voice Command, Lexus Insider, Electrochromatic Auto-Dimming Rearview Mirror ($2,835), Body Side Moldings ($199), and Illuminated Door Sills ($425). All high-end options. Our 2017 IS 350 came in a handsome Atomic Silver color, almost resembling a light gold. Although not a color that particularly stood out, still, it was handsome in this sedan. 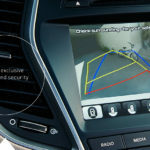 The driver controls the stereo and navigation-among other functions-with the click-mouse device. Although it seems a little dated, weâ€™re used to it now. One would expect, though, a more up-to-date system with Android and Apple devices. Hard to beat the sound emanating from this Mark Levinson, 15 speaker system. Concert hall quality. The brake assist warned us a few times about following too close. A good example of paying attention when behind the wheel. The IS350 cabin is small by comparison, although we find this part of the ISâ€™ charm. It feels more agile and sporty. There isnâ€™t much space to store items, however, such as a phone, extra keys, etc. The center console provides two cupholders, the USB cable hookup, but not a convenient phone holder apparatus. The design on the 2017 IS is third-generation, and a tad more distinctive, especially with that front grille. A bit edgier, the new look more more up-to-date. Opinions will vary when eyeing the ISâ€™ backend, with its downward sweep. Youâ€™ll like it or not. We like it. Although there may not really be anything to notice in the ISâ€™ cabin, itâ€™s pure Lexus and we especially liked the F Sport red seating. While when first introduced, the center analogue clock was hip (started by Infiniti), it now feels dated, and perhaps a little out of place in high-tech times. All functions are easily operated, and although it seems as though there are numerous buttons, we are accustomed to them, and find it intuitive. The seats are very comfortable and hug the driver well. The 8-speed automatic transmission shifts effortlessly. The 3.5-liter, V6 engine with 306 horse is more than adequate to move the ISâ€™ almost 4,000 pounds. Perhaps the weight of the IS is why this sedan feels heavy. At times it feels a little clunky, but not ponderous. Maybe just dated? Not a bad thing because at the same time, it makes the IS feel solid. We always fall into driving the IS very quickly and comfortably and find that it would be a preferred daily driver if having to make a choice. The ISâ€™ weight doesnâ€™t seem to affect its performance, either. Claiming a 0-60 mph in 5.9 seconds, the IS350 does a fairly good job of getting out front and center. The 3.5 V-6 engine is smooth and quiet. Although we donâ€™t care much for the paddle shifters, the F Sport mode feels more itself in Sport+ mode. Can one think of this IS as a â€˜sportâ€™ or performance car? Probably not. Itâ€™s more of a luxury, or nearly so, sedan. If you want to stay with Lexus and be sporty, aim for the RC. We donâ€™t really match it with the BMW or Audi sedans. Most buy Lexus brands for their dependability, and after-sales service/attention. They havenâ€™t always-at least until just recently-been competitive in terms of styling and pizazz. More so, a little dull, yet great cars. Ride quality is better than average, as expected, and the cabin is for the most part Lexus quiet; some road noise when highway driving. The IS takes rougher road surfaces well and remains on point; adaptive damping taking up most of the slack. Safety equipment abounds, with eight airbags (including knee bags for front seat occupants), ABS, stability and traction controls, blind spot sensor, lane departure warning, rear cross traffic alert, auto emergency braking, forward collision detection, brake assist and driver attention detection. The IS scores a â€œ5,â€ the highest rating possible. There isnâ€™t much to complain about in the ES350. We wonder, though, if the lane departure warning and rear cross traffic alert, rather than a vibration, are not always caught or heeded. This is a matter of getting used to these features, we thin. The only complaint here is that both lane departure warning and rear cross traffic alert are too polite – a little more information as to what’s going on would be helpful. What can one really say that is negative about a Lexus product? The Lexus experience is legendary, and owners buy again and again, as well as hold onto their cars for years. For those who claim the IS feels a little old, this fact matters none to Lexus followers. As it gets closer to the competition, it still maintains what makes it a Lexus. And many are just fine with that. Engine: 3.5-liter V6 24-valve, dual overhead cam, Direct injection, VVT-I, 277 lb.-ft. torque, 306 hp. EPA Fuel Economy: 19/26/21 mpg. The 2017 Yaris iA-a new addition to the Toyota lineup, coming over from Scion in 2016. A Scion product in its other life, the iA sedan comes into 2017 mostly unchanged. Other than the Toyota badge, the iA offers a few new color choices. There is only one trim level from which to choose in this relatively fun car to drive. While nothing special, the Yaris iA will provide great fuel economy, a solid ride and ease of handling and parking. The Yaris iA offers several features at a reasonable price. How many vehicles today fall in under the $20,000 ceiling? It handles well, has a plain, yet upscale feeling interior, and free maintenance and roadside assistance for two years, or 25,000-miles. While this econo-box has many good qualities, itâ€™s not a standout. Rear passenger room is limited and a tall driver might find the front seating a tad tight. When navigating hills or on-ramps, the Yaris iA struggles a bit, but then again, it is not competing with sedans of bigger status. Competitors in the subcompact category include the Ford Fiesta, Kia Rio, Nissan Versa and Hyundai Accent. 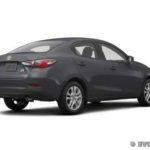 The iA is based on the Mazda2-not sold in the U.S. Our test Yaris iA came equipped with the six-speed manual transmission that was fun to drive. Buyers can opt for the six-speed automatic transmission, without sacrificing fuel economy too noticeably. Our Yaris iA came equipped with standard safety features, including Dynamic Stability Control, Traction Control System, Low-Speed Pre-Collision System, ABS, Electronic Brake Force and Brake Assist. Impressive for a subcompact vehicle. Several airbags, including side and side curtain airbags abound. Also standard are a tire pressure monitoring system, Integrated rearview backup camera, remote keyless entry and push-button start. Cruise control, power door locks, mirrors and windows are also standard. A/C, rear window defogger and 60/40 split-fold flat rear seating are also included. Yaris is Toyotaâ€™s smallest sedan, just below the ever-popular Corolla. 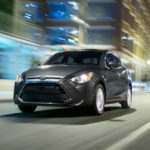 Following Scionâ€™s â€˜monospecâ€™ policy, the Yaris iA has no optional packages or individual features. It is what it is and you get just that, which must surely make it easier for Toyota. A fun car to drive, the Yaris iA resembles Mazda in that regard. Easy to handle with some surprising pep, it is quieter than most subcompacts. The interior is comfortable, though legroom might be a problem from six-footers. The tilt-telescoping steering wheel helps that. The sound system, an AM/FM/HD radio has nine speakers, AUX, two USB ports, and streaming via Bluetooth, voice recognition, connected service suite with Pandora, AHA and Stitcher radio. The 7-inch touchscreen displays audio and operates with a multi-function commander control. Fuel Tank Capacity: 11.6 gal. EPA Fuel Economy: 30/34/39 mpg. The all-new, redesigned 2017 Hyundai Santa Fe keeps getting better, bigger and more costly. Our test â€œLimited Ultimateâ€ edition came in just over $44,000; a high total vehicle price, we think, for a â€˜reasonably pricedâ€™ Hyundai vehicle. But then, we sound out of touch harping about high-priced vehicles since in 2017, theyâ€™re all priced high. With crossover vehicles and SUVâ€™s being the most sought-after categories in Autoland, all manufacturers are trying to hit the mark. Checking all the boxes, Hyundai tries to deliver a large, well-equipped SUV in the 2017 Santa Fe that smacks of near-luxury. For consumers seeking a spacious, three-row SUV, the Santa Fe offers a winning recipe, including up-to-date technology, a long list of standard equipment and handsome styling. The Santa Feâ€™s cabin is friendly, and comfortable; one can haul a fair amount of cargo, with Hyundaiâ€™s 3.3-liter V6 engine, there seems to be plenty of power. Introduced at the 2016 Chicago Auto Show, the Santa Fe gets larger, and better with each iteration. The Santa Fe is available in several trim levels: SE ($30,800 FWD/32,550 AWD); Limited ($34,950 FWD, $36,700 AWD); Ultimate ((38,700 FWD, $40,450 AWD); and Limited Ultimate ($39,400 FWD, $41,150 AWD). Options include HID Headlights with dynamic bending light, Electronic parking brake, Smart Cruise Control, Lane Departure Warning, Auto Emergency Braking with Pedestrian Detection and High Beam Assist. Our test Santa Fe Limited Ultimate came with a couple of options, including the Ultimate Tech Package (Smart Cruise Control w/Stop/Start, Automatic Emergency Braking w/Pedestrian Detection, Lane Departure Warning, Electronic Parking Brake, High Intensity Discharge Headlights (HID), Dynamic Bending Light and High Beam Assist, $2,100; and Carpeted Floor Mats, $150. There are many larger SUVâ€™s to choose from and the 2017 Santa Fe most closely matches up to the Ford Explorer, Nissan Pathfinder and Mazda CX-9. A tad shorter in length than these three vehicles, the Santa Feâ€™s wheelbase is also a little shorter. However, storage space in the Santa Fe measures up to 80 cu. Ft. when folded flat. We tested out the cargo space when hauling several car loads of stuff to a locker-including a good size sofa. The couch fit all the way in the Santa Fe, with room to spare and the back door easily closed. If we owned a Santa Fe-or any SUV for that matter, it would strictly be to tote around the four dogs that take up residence in our home. Even then, they much prefer riding on the seats in the upright position, as opposed to when the seating is flat. Better control. So, like most SUV owners, the seats probably would remain in the upward position most of the time. The second-row seating in the Santa Fe is bucket seating. Supportive, yet only accommodating two passengers, Buyers can opt for a bench, if preferred. The third row seats are not terribly small, and passengers can even manage their own climate control. Our Limited Ultimate Santa Fe is of course, the top-of-the-line Santa Fe, the interior is well done. Seating is comfortable and fits all body styles. Appointments are upscale and soft, controls easily reached and extra space to spare, both in the console and doors. We found the Santa Fe easy to maneuver and park, and offering a comfortable ride on most road surfaces. However, we did notice when taking bumps, the rear suspension took it hard. The interior in our 2017 Santa Fe felt like top notch. Leather trim, eight-inch touchscreen infotainment system with Android Auto and 12-speaker Infinity sound system, as well as heated/ventilated front seats were all upgrades. Handsome 19-inch alloy wheels suit the 19-inch tires that provide for the most part, a quiet ride and handling experience. Our optional Tech Package at $2,100 is probably worth it when wanting the latest in technology, if youâ€™re into that kind of thing. We find that many times when in top-of-the-line press vehicles, we donâ€™t even get to all the fancy stuff. But assume that those who are high tech will like them and learn how to use them. Our test Santa Fe came with AWD; also available with FWD, paired with the same six-speed automatic transmission. Having driven the Santa Fe alone, itâ€™s hard to know if when loaded up, it would perform similarly. Even when full of â€˜stuff,â€™ it handled well. What makes a consumer select one manufacturer/style/vehicle over another? It is a difficult choice today, given there are so many to consider. Perhaps one of the better, more desirable three-row SUVâ€™s on the market today, the Santa Fe remains ever popular. It feels refined, void of many glaring weaknesses, and although not â€˜perfect,â€™ we think it wears well over time. Fuel Tank Capacity: 18.8 gal.